I remember trying these. They deadened the feeling in my stomach. Seems every weight loss aid invariably added a statement such as "...along with a sensible diet and exercise program." Of course if you had the self-control to actually diet and exercise you wouldn't need their (worthless) product in the first place. No wonder they went out of business. Can you imagine your product name being the same as a fatal disease? My mom used these for a while and I thought they were candy so I would eat them. They tasted pretty good but don't remember it slowing my appetite down. 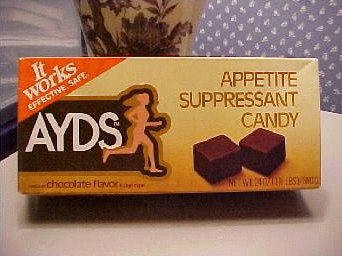 Suddenly the commercials took on a whole different meaning when someone said, "I lost weight with Ayds!"